EDITOR’S NOTE – MARCH 24, 2009 – I get a lot of traffic to this story, a few e-mails asking questions, and great comments left for this blog entry. I’m really curious how you readers are finding this bit of text. Please leave a comment telling me how! Behold, puny mortals, my latest thrift store acquisition! St. Vincent De Paul got the shaft as I saved 50% off this $1 piece of raw computational power. 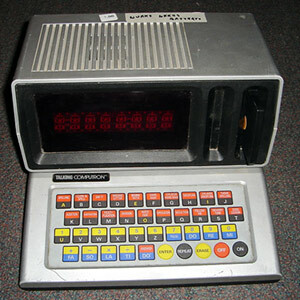 The 1986 Talking Computron by VTel features a membrane keyboard, eight-character red LED alpha-numeric display, 20 built-in programs, cartridge slot, and even a real electronic voice! It is powered by 6 C batteries or a 9v 300mA adapter. On the top of the unit written on tape it says verbatim “WURKS NEEDS BATTERYS.” Because I do not have C batteries available to power the unit I am left to wildly speculate as to the true capabilities of this device. To put this all into perspective I will compare and contrast with another deus ex machina, the Sony PlayStation 3. The Talking Computron has a built-in keyboard whereas the PS3 only has USB ports to plug one in. Advantage Computron. Both systems have fonts on the side of the machine that demand your focused attention. Advantage none. “Talking Computron” is 16 characters long while “PLAYSTATION 3” is only 11. Advantage Computron. Plus one for correct spacing for Computron. Minus one for PS3 for using CAPS LOCK. Both systems produce an image that hurts to look at in low definition. Advantage none. Talking Computron came with twenty built-in games plus a cartridge called “Dress Up and Theatre” while PS3 came with the Cross Media Bar. Advantage Computron. PS3 collects dust superbly on its shiny black surface. Talking Computron collects dust in impossible to clean edges. Advantage none. PS3 can interface with the PlayStation Portable. The Talking Computron has unknown interface capabilities. Which is scarier? The known or the unknown? Talking Computron plus one. I am drinking a tasty beverage responsibly whilst writing this. Plus one to me for responsible drinking and plus another for usage of “whilst.” Minus one for drinking it alone. Talking Computron features built in math software while the PS3 does not. Obviously people who blew $600 do not know the value of money. Advantage Talking Computron. The PS3 and Talking Computron both lack rumble functionality. Advantage none. According to my rudimentary and lackluster American public education math skills the final totals come to Talking Computron with 6, PS3 with -1, and myself with a point. Not bad for a $0.50 investment. September 3, 2009 Update: The Talking Computron sold for $23 on eBay sometime last month. I had no clue that it would fetch so much, let alone sell at all. Hahaha… I have this. I have had it since I was born. It’s awesome. I can’t believe it still works. I wish I could find some games or cartilages for it. I got one of this when i was a kid, and today when sorting out my parents storage, i suddenly hear that familiar computervoice! I can not believe it is still working 😀 Mine looks slightly different – smaller and shaped monitor. It is a great learningtool for children. As an 8 year old norwegian in mid 80s it was the most interesting and useful ‘toy’ i could ever have. Like Robin i hope to find some of thoseadditional games. WOW! My mom sent this link to me and I almost peed my pants! Not only was I in shock to see a computer I myself once owned, but I was also given the joy of reading your body copy! Its crazy to think that something that costs you only $.50 could beat something that costs $600 by 7 points!!! Thanks for the laugh!!! Ha Ha!!!!!!!!! I paid $2 for this at a garage sale. It’s better than the V-Smile games. This is the first time I’ve ever seen one of these and my 60 yr old husband enjoys playing with it. Better than the PS3, most definetly!!!!!!!!!!!!!! yeah. i usually dont leave comments on blogs, but i had to come in and tell you how awesome you are for bringing back computron. i am now on a mission. lol. I got one but the screen on the left side is missing. I love the computron man and you can not beat that eigther. And mine still work great. Lets all bring back the 80’s computron. I too had one of these, probably in 1986, too. I had one cartridge (something to do with a Space Adventure). All the cartridge did was change the games around to make them sound different (Space/Sci Fi oriented words for the spelling games and such). When I’d get bored, I’d take out the cartridge and listen to it get confused. Computron Hangman – the most awesome game ever! I got one of these at a junk sale for $1 and my nephew loves it. I wish I could find some of the other games for it… maybe someone here knows a ‘source’. I GOT ONE OF THESE FOR MY DAUGHTER, WHO IS NOW 30 YEARS OLD. IT STILL WORKS FINE AND I’M USING IT TO TEACH HER KIDS. IT BEATS ANYTHING I’VE EVER SEEN OR BOUGHT FOR MY KIDS.I WOULD LOVE TO GET HOLD OF ANOTHER ONE,SO THE KIDS CAN COMPETE AGAINST EACH OTHER. I used to have one of these things when I was eight or nine years old, in the late ’80s. I was trying to figure out the name of it (even posted on the Livejournal community whatwasthatone) then got the idea to to a Google search for “1980s electronic game ‘please choose an activity'”. This was the only result besides my own post, heh. I freakin’ loved that thing. Except when I was doing the spelling activity and it told me to spell “apple”, I thought it was saying “pothole”. I had forgotten what this was called. I remember I had this back in the late 80’s as well. The thing that made me find this article was I just could not get out of my head the little electronic music-maker that it did with that stupid song from Sound of Music. I remembered the phrase “Rocket to Zenon” and found this article. I LOVED the Computron! I don’t know what ever happened to mine, and if I tried to get another one for nostalgia’s sake, my wife would have my head…but man, I loved this thing! Where can I buy a Talking Computron and what is the price? I have two of these that are working. I am ready to part with them, as I have learned all that I can as well as my children. Seeing the post from Nov. 23, I am hoping that someone is interested. I would hate for these to go to waste. They are currently in Indiana. does anyone have the computron 1986 manual? I need a copy of it!! I found this blog post by searching Google for “Sears Talking Computron” and it was on the first page of results, down a bit from the YouTube videos. I have one of these, still have the box and manual and A/C adapter which is good because my battery terminals seem to have a thick coat of rust on them. I might try to clean that out just because it bothers me having rusted out battery terminals. I just turned on and played “Spelling” on this for the first time in MANY many years. It’s great!